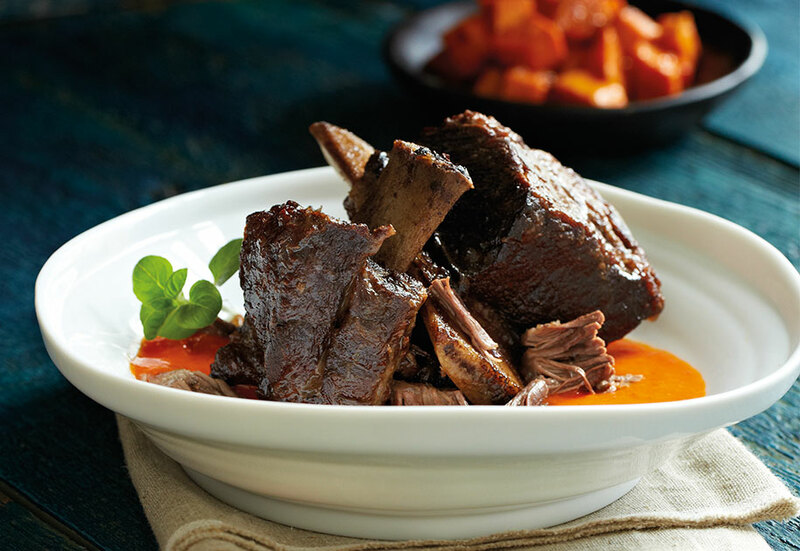 Chef Andrew George redefines 'crowd-pleaser' with these nutritious and hearty bad boys. Extra napkins are a must. I’ve selected this dish as it reminds me of my grandparents’ place. The kitchen was always filled with wonderful aromas while my mother worked hard to prepare whatever was on hand. This dish was inspired by my memories of our soups and stews, but it stands on its own with local roasted root vegetables and the unique addition of pesto. I now use this recipe when teaching my students different sauces and braising methods for cooking ribs. Pat dry buffalo ribs with paper towel and season with freshly cracked pepper. Brown ribs in hot oil in brazier on top of stove and then place in an oven-proof roasting pan. In a bowl, mix together the tomatoes, soya sauce, brown sugar, vegetable oil and crushed garlic with the red pepper pesto. Pour over brazed ribs. Place ribs in hot oven and baste every 30 minutes until meat is very tender and begins to fall off the bone when pulled with a fork (approximately 3 hours). Place the red peppers on a baking sheet and sprinkle them with 1 tbsp. of olive oil. Transfer the peppers to the oven and roast for 1 hour, turning them over at the 30 minute mark. Remove peppers from the oven and allow them to cool to room temperature, about 15 minutes. When the peppers are cool, remove the seeds and stem with a knife. Set aside. In a food processor, add the garlic cloves and walnuts; pulse until the mixture resembles a coarse meal. Next, throw in the roasted red peppers, 2 tbsp. of olive oil, fresh basil, Parmesan-Reggiano, and crushed red pepper. Pulse the mixture for about 1 minute until it is smooth-ish. Add salt and additional crushed red pepper to taste. Andrew George is an acclaimed chef dedicated to promoting healthy Indigenous food and its presence in mainstream cuisine. He has been a chef in top restaurants and resorts across the country and has mentored youth in many kitchens; most notably, at the 2010 Vancouver Olympic Games. Andrew is the co-author of A Feast for All Seasons: Traditional Native People's Cuisine and Modern Native Feasts: Healthy, Innovative, Sustainable Cuisine.